Bonefasio Rokomasi is a typi­cal itaukei father of two. The 31-year-old Mr Rokomasi of Nasealevu, Sasa, Macuata is a cash crop farmer who travels to Labasa town twice a month to shop with his young family. The father of two uses his trip to treat them and his wife. Nasealevu is about 20 kilometres from Labasa town. 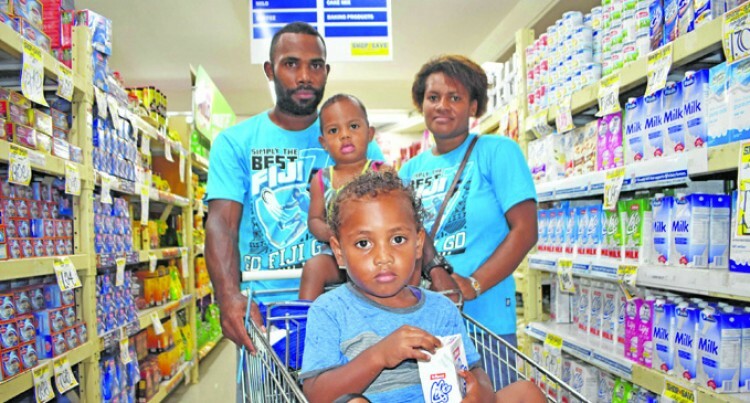 Part of the treat is to shop as a family at Labasa’s Shop N Save su­permarket. He is a regular shopper at SNS. “I do my shopping twice a month and this is because we live far from town. It takes us more than an hour to reach Labasa by bus and that is quite a hassle,” Mr Rokomasi said. “We catch the bus so we are usu­ally up early in the morning to be at the main road for Labasa,” he said. “My wife has already drawn up our shopping list and plan for a day out at Labasa the day before. “She checks what is at home and what is not so that we don’t buy un­necessary items. We always stick to the shopping list to avoid over spending. The Rokomasis set aside $150 for their fortnight shopping. “This supermarket is a farmer’s supermarket – the prices are rea­sonable and you can get everything under one roof. “The heat is frustrating so the sooner we do our shopping the bet­ter for us. It is not easy to have two young children tagging along dur­ing this kind of outing. “They need to be here with us as a family – this brings us closer. After dropping off at school more than ten years ago Mr Rokomasi returned to his village to utilise his land. “No itaukei should be relying on others to feed them, we have land which we should cultivate,” he said. “I plant vegetables and root crops at my farm and am able to make a living from my harvest. “I am my own boss, I schedule my days according to what I need to do from clearing the land, planting, weeding and other farm chores. Mr Rokomasi shares how to make his favourite dish – Ota Miti (wild ferns in coconut cream).